Oklahoma City Thunder (27-7) – The Oklahoma City Thunder are showing that they have learned a thing or two from their early playoff exits in years past as they lead the western conference heading into the second half of the season. While they rank 3rd in points per game and 7th in rebounds per game, they rank 20th in opponents points per game, which begs the question of whether they will be able to get stops come playoff time. Kevin Durant and Russell Westbrook have shown no signs of bad chemistry throughout the first half of the season and Westbrook has shared the scoring load with KD in real Batman and Robin fashion. 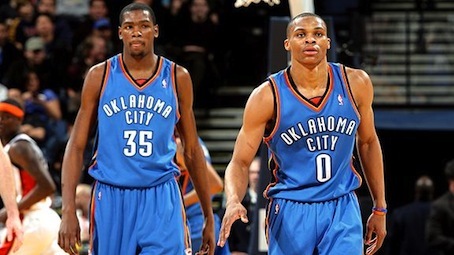 Bottom Line: The only thing standing between the Oklahoma City Thunder and a shot at the title is themselves. Last year in the playoffs, the team struggled to find playmakers in the final minutes as Durantula got outmuscled and Westbrook struggled with consistently making shots from the perimeter. While James Harden can serve as the team’s wildcard come playoff time, the team must be able to stop their opponents in clutch moments. San Antonio Spurs (24-10) – The grumpy old men of the Western Conference are at it again. This time they enter the all star break in second place in the West and are playing great basketball. Coach Greg Popovich’s gang is scoring a surprising 99 points per game , which ranks 4th in the league. Perhaps more importantly, they rank 5th in the league at field goal percentage and 3rd in the league at assists per game, which shows that ball movement and offensive efficiency has been a priority for the veteran squad. Bottom Line: Health. Health. Health. Two years ago I proclaimed to my friends that “IT WAS OVER! !” for the San Anthonio Spurs. And if they can’t stay healthy throughout the second half of the season, they may prove me right. The Spurs are in a similar situation as the Celtics as they are at a crossroads with the team as constituted. Tim Duncan is a shell of himself. Manu Ginolbli, while dangerous, has struggled with various health related issues over the past few seasons. Tony Parker has performed well enough to be considered an MVP candidate in the first half of the season. Even still, Spurs fans should still be cautiously optimistic about their team’s chances come playoff time. Los Angeles Clippers (20-11) – These are NOT your father’s Los Angeles Clippers. The team hailing from “Lob City” reinvigorated the team by trading for Chris Paul prior to the season and hasn’t looked the same since. While the team has suffered some close losses and an injury or two, most Clippers fans see the promised land in sight, the playoffs. While the team ranks 8th in field goal percentage, definitely a contribution of Chris Paul to the offensive efficiency, the team is in the middle of the pack in opponents points per game allowed and field goal percentage allowed. Their defense must become better in order to make noise in the playoffs. Bottom Line: The Clippers have a tremendous amount of upside. Deandre Jordan, Blake Griffin, & Caron Butler give Paul a front court that a point guard usually dreams of. With Paul’s leadership, the team should absolutely being looking to make the conference finals at least. In order to do so they must prove that they can get defensive stops in the 4th quarter. Dallas Mavericks (21-13) – After a rocky start to the season, the Dallas Mavericks started to resemble their championship form winning 7 of their last 9 games heading into the all star break. Rick Carlisle again has his team performing at a high level on defense, where they rank 2nd in the league at field goal percentage allowed and fifth in the league at points per game allowed. Dirk “I got my Championship swag now” Nowitzki is leading the team with almost 20 points per game. Bottom Line: Statistically there isn’t much to dislike about the Mavericks. They’re 5th in the league in rebounding per game and 9th in assists per game. Despite new faces such as Vince Carter, Delonte West, and Lamar Odom the team has leaned on the same players that carried them to the plaayoffs last year in Nowitzki, Jason Kidd and Jason Terry. For this years team, Odom must become more of a factor for the team. Odom is a a player that is a matchup nightmare for most power forwards/small forwards in the league. He might be the x factor going into the playoffs for the team. Which is a scary thought if I’m a Mavericks fan. Los Angeles Lakers (20-14) – Many of the faces on the Los Angeles Lakers roster are the same as last year. But the most important face that has changed for the Lakers is the Head Coach. Mike Brown, in year one with the Lakers, has lead the Lakers to be one of the best rebounding and defensive teams in the league. Ranking 4th in opponents field goal percentage and sixth in opponents points allowed per game, the Lakers are a team that is very much built for the playoffs as they can get stops and rebound in critical moments with their version of the twin towers in the middle. Bottom Line: Trade rumors have created a stormy environment for Kobe Bryant’s team as Pau Gasol has been mentioned in about every trade scenario this season. While the Lakers are great defensively, the team cannot score. Outside of Bryant, the rest of the team has struggled to pick up the slack, thus ranking 22nd in the league in points per game. This is an issue that might be resolved when a decision in made about whether to keep Gasol or not. Regardless, this team will stuggle in any matchup if they cannot score. Houston Rockets (20-14) – The Houston Rockets are possibly the quietest potential playoff team in the history of the league. No one knows that this team is 9th in the league in points per game. Or that they’re 3rd in the league in free throw percentage. The Rockets are flying under the radar mostly because they lack the flash some teams offer and they don’t have a superstar. Head Coach Kevin McHale and GM Daryl Morey have assembled a fundamentally sound, unselfish basketball team. Kevin Martin leads the team in scoring, but no one could identify who he was unless he had Morey with him at all times to say, “Hey! You’re Kevin Martin!”. They are middle of the road in a most other categories and remain a bit of an enigma to most of the Western Conference and even some of it’s own fans. Bottom Line: If the season ended today the Rockets would end up playing the Clippers, against a team that, other than Caron Butler and Chris Paul, lacks a ton of playoff experience. This would be the best matchup the Rockets could ask for. While the Rockets too do not have a wealth of experience, it might be best that they face a team that shares that problem as opposed to a team with a ton of playoff experience, such as the Mavericks or Spurs. Memphis Grizzlies (19-15) – The Memphis Grizzlies are back again this year to prove that year was no fluke. And this time their health… what? Zach Randolph is hurt? Well once again the Grizzlies will have to make a playoff push without one of its top performers from last year. Rudy Gay is back with the team this year and leads them in scoring with almost 19 points per game. Marc Gasol is also continuing his amazing pace from last year and is leading the team in rebounds with 10 per game. Not to mention the two blocks per game he contributes. Bottom Line: For the Grizzlies the playoff outlook is certainly a tough one without Zack Randolph. The team is in middle of the road in most statistical categories other than points per game allowed, where they rank 9th. The other part of the equation in the playoffs is being able to score points on crucial possessions. The Lakers, who share Memphis’s defensive prowess, at least has Kobe to turn to in those moments. Who will get the ball to the Grizzlies? Portland Trailblazers (18-16) – In 8th place in the conference, are the Portland “Rip City” Trailblazers. Nate McMillan is again doing a great coaching job with the team, as they play their first full season without Brandon Roy. This year the team ranks 6th in the league in points per game and 10th in points per game allowed. The team also moves the ball effectively, as they rank 7th in the league in assists per game. Their all star Lamarcus Aldridge is leading the team in scoring with 22 points and 8 rebounds per game. Bottom Line: The Trailblazers are a team that shows how deep the Western Conference is. No team wants to face the Blazers in the playoffs. Gerald Wallace, one of the best perimeter defenders in the league, and Marcus Camby in the post solidify the front court of the Blazers to be one of the best in the West. The team acquired Jamal Crawford in the off season, who is one of the best scorers off the bench. A large portion of the Blazers ability to be successful is to based on their draw come playoff time. Honorable Mention: Denver Nuggets (18-17) – The Denver Nuggets are a very interesting team in the West. They are a team that is playing without their “best” player in Danillo Gallinari, and is still missing one of their big contributors from last year, Wilson Chandler. Despite these losses, the Nuggets find themselves 1/2 a game outside the playoffs entering the 2nd half of the season. The Nuggets are one of the best scoring teams in the league as they rank 2nd in points per game and assists per game. The problem? The Nuggets also rank 28th in the league in points per game allowed. Honorable Mention: Minnesota Timberwolves (17-17) – No one is as excited to see the Timberwolves be competitive as their GM David Kahn. After drafting Ricky Rubio 2 years ago and waiting patiently for his arrival, the rookie has not disappointed creating formidable 1-2 punch with standout Kevin Love. The Timberwolves are a very young team with a ton of upside. The problem? The team has very few veterans and ranks in the middle of the pack in scoring efficiency. While Head Coach Rick Adelman has done a great job this season, it is just year one of this Rubio-Love-Adelman marriage. T’Wolves fans should be excited about their long term outlook for a change. But if this team makes the playoffs, it will more than likely be an early exit.